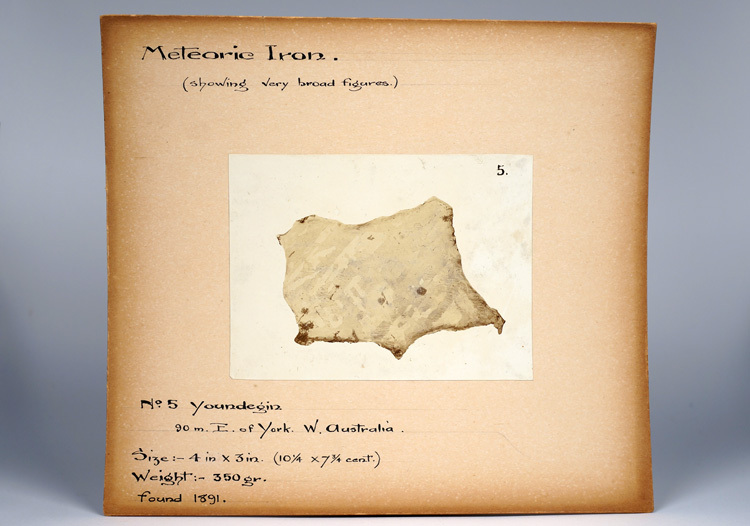 On January 5, 1884, a mounted police constable named Alfred Eaton discovered four large masses of iron while on duty in the district of Youndegin, Western Australia. The specimens were identified as meteoric iron by a geologist and were soon acquired by the British Museum, the Geological Museum at Freemantle, and the Melbourne Museum. 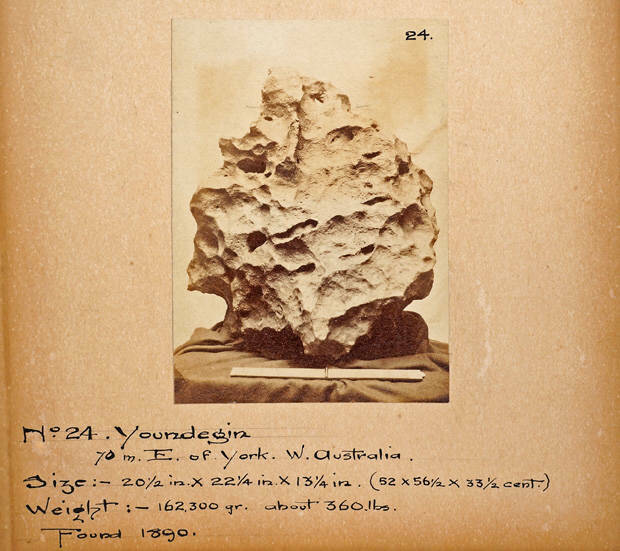 In 1890 a fifth mass of Youndegin weighing 173 kg was found and subsequently acquired by British meteorite dealer James Gregory (1832-1899). Gregory, who also published a monograph and press release on Youndegin, sold the beautiful mass to Henry A. Ward (1834-1906). This same specimen now resides in the Field Museum of Natural History, Chicago. In the decades that followed, additional masses were found including the main mass, which weighed an astonishing 910 kg. Though Youndegin has a large recovered weight, the majority of specimens are large aesthetic individuals custodied by museums, and its distribution amongst private collectors seems poor. Today, some 133 years after its original discovery, I am pleased to offer some specimens of Youndegin that were originally acquired by David New many years ago (Provenance: D. New; J. Schwade; J. Piatek). Additionally, buyers have the opportunity to acquire some rare and original 19th c. Youndegin documents and albumen from the James Gregory estate. All specimens come with a label from our own collection. Shipping costs are as follows: Priority Mail USA $7.20. International First Class $13.95. 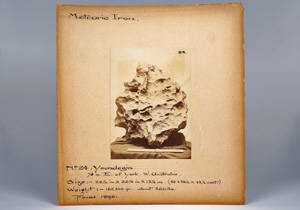 FEATURED SPECIMEN: 19.6 grams with large inclusion + original monograph and press release from the Gregory estate. Specimen measures 29 x 28 x 4 mm. 29 x 28 x 4 mm. 18 x 14 x 4 mm. 17 x 14 x 4 mm. c.1892 James Gregory mounted albumen photo of a Youndegin slice. A neatly-labeled, one-of-a-kind artifact from one of the most important British meteorite dealers of the 19th century. Measures 7 x 6.25 inches. c.1892 James Gregory mounted albumen photo of 173kg Youndegin. This same photo is featured in Gregory's monograph. Specimen now resides at FMNH, Chicago. Measures 7 x 6.25 inches. 15 x 14 x 3 mm. 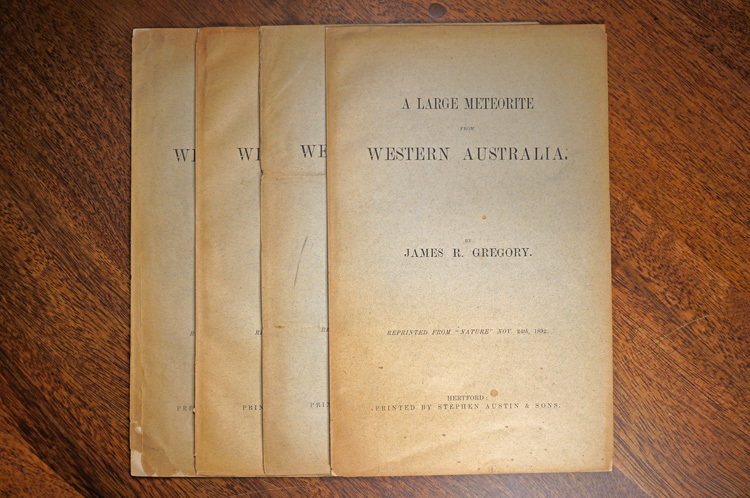 1892 Gregory monograph on 173 kg Youndegin. 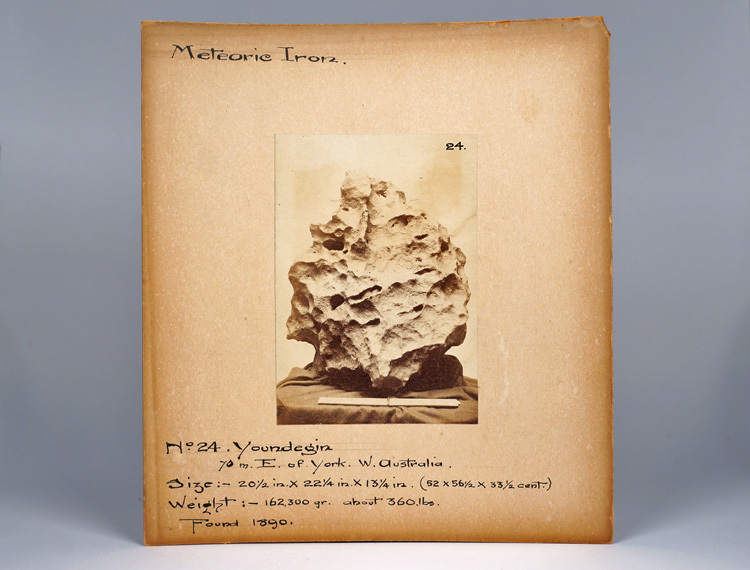 Above: c.1892 mounted albumen print from J.Gregory showing a 173kg mass of Youndegin.